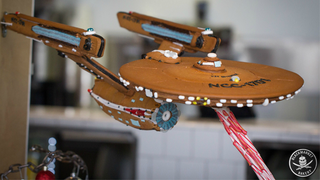 Sorry, Gingerbread Serenity - your reign as première gingerbread starship may have come to an end, because this biscuity, holidays-themed U.S.S. Enterprise is pretty damn amazing. The beautiful Constitution Class bit of baking comes from Blackmarket Bakery in CA, who created it to display in their Costa Mesa store window. It's a spectacular bit of food modelling, lots of lovely sweet details - but most impressive is the candy cane tractor beam that helps to support the Enterprise over its dessert-laden base (as well as a wall bracket). Structurally sound and delicious? Scotty would approve. Check out plenty more pictures in the Imgur gallery below.